Handmade Orange and Black African Wood Wall Mask, "Ahinkwa"
Anna Yawson in Ghana presents an original mask design that it simple yet bold. 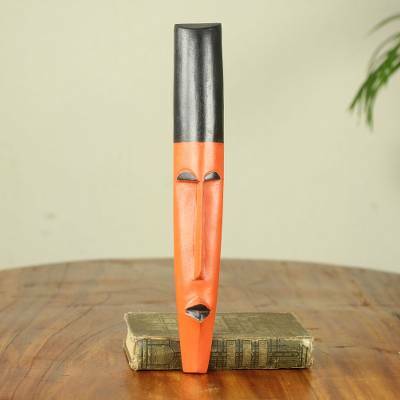 The elongated mask is carved by hand from sese wood and painted bright orange and black. The artisan names the design ahinkwa, which means "king's servant" in the Twi dialect of the Akan tribe. "One thing I have come to love about carving is that there is no waste of wood. Every small piece of wood can be used to create small creatures." "The skill to design is inborn. I can create sketches of styles for fabric before sending them to the seamstress and I'm also particular about details on every dress sewn for me. "I was born on December 10 in Accra, the capital of Ghana. I am a jovial person. I try to make the people who come close to me happy. I like dancing and having fun. "I got the opportunity to work as an art vendor. During that time, I visited several art workshops and observed carvers busy at work. Because of my love for design, I took particular interest in the way products were designed in wood. I also took keen interest in the final pieces. When my employers noticed my ability to identify the slightest differences in products, I was promoted to quality control personnel for the company. "When this company finally left the country, I had developed an interest in arts and crafts, and was encouraged to attend an export school. After completion of the course, I sought out several carvers to collaborate with me. I'd sketch the designs on paper, then sit close to them as they did the carving. I also learned to nail the aluminum on the wood. Working with my hands was so interesting! "One thing I have come to love about carving is that there is no waste of wood. Every small piece of wood can be used to create small creatures. It gives me so much joy to see finished designs being admired, and my design work helps me pay for my children's education. "When I first got involved with carving, some of the carvers ran away with the money intended to purchase wood for designs. It was not easy at all. I learned a lot from those experiences, and learned how to negotiate with the carvers. Paying them promptly for their help encouraged the carvers to give me their best efforts. They also spread the news about my faithful dealings with them, so I don't struggle when I need more carvers to assist me. These were lessons I learned the hard way. "I have trained two people and I also work with three experienced designers. At the moment, I provide jobs for ten artisans. It is my dream to increase in sales and be able to expand my workshop."